The Notice to Tipped Employees is a general labor law poster poster by the Maryland Department Of Labor, Licensing and Regulation. This poster is mandatory for some employers, including employers of tipped employees. This poster must be posted in a conspicuous place where all tipped employees will see it. This poster describes what a tipped employee is and that tipped employees are protected from paying certain fees or getting deductions to their paychecks due to the actions of customers. This poster also tells who to talk to in case this law has been violated. It appears you don't have a PDF plugin for this browser. 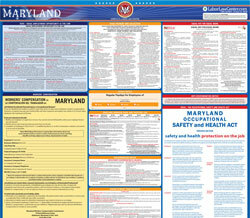 Please see the link below to download maryland-esstipinfo.pdf. POST THIS NOTICE IN A PLACE WHERE ANY TIPPED EMPLOYEE IS EMPLOYED. received more than $30 each month in tips or gratuities. charge for food or beverages.